The Beatles in India: Recollections at the opening of a Liverpool exhibition . Beatles Radio: The Beatles, Solos, Covers, Birthdays, News The Fab 4 and More! 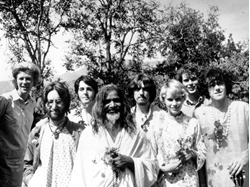 Fifty years ago, between 16 and 19 February 1968, the four Beatles and their partners flew to India to learn about meditation from Maharishi Mahesh Yogi. Their journey, both physical and spiritual, is being celebrated in an exhibition as part of The Beatles Story at the Albert Dock in their hometown of Liverpool. Enter the space and smell the sandalwood incense! Experience the vibrant colours of the compound! Walk in the living quarters where the Beatles wrote their songs! See Donovan’s guitar and Ravi Shankar’s sitar! Martin King, the managing director of The Beatles Story, says, “We are trying to give a real feeling of the Ganges and the foothills of the Himalayas at the Albert Dock. Even the floor covering is like a grassy pathway. You see John Lennon’s No.9 bungalow with Donovan’s guitar outside and the idea is that they have been playing together and just left the set.